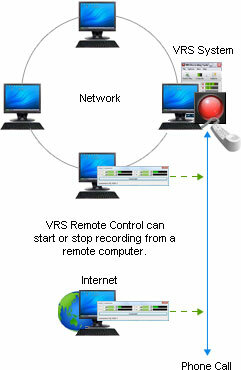 VRS Remote Control is a tool that lets you start and stop recording on a channel on the VRS Recording System from other workstations on the computer network, or over the internet. This clever addition to the VRS System is perfect for operators on a network who need to be able to control the VRS Recording System from their machine, even though the software is only installed on a central computer (say in the telecoms room). The VRS Remote Control is also very useful in a call center environment when operators must record parts of calls, but there are many other practical uses for this software. Implementing the VRS Remote Control is easy. After you have installed the VRS Recording System on your central computer simply install VRS Remote Control on each of the workstations. Setup is simply a matter of specifying the name of the VRS server and channel to record. This tool requires VRS Recording System version 3.10 or later. 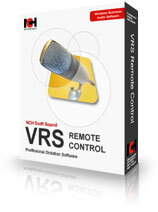 Assuming you have purchased a valid license for the VRS Recording System, the VRS Remote Control is free. If you have problems running the VRS Remote Control, please see www.nch.com.au/vrs/support.html. NCH Software supplies a number of other business audio related software applications. We also offer corporate software development services to customize or create new audio software for you. Please see www.nch.com.au/software for more information.